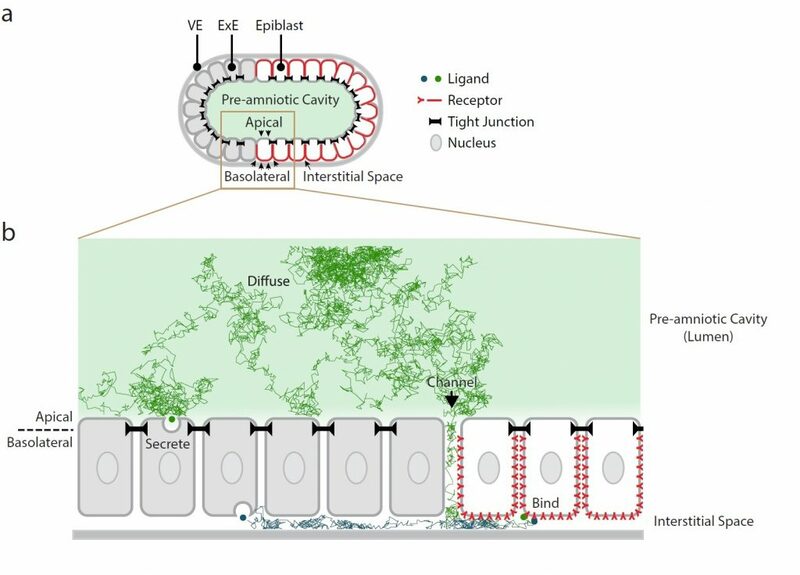 Background: Morphogens are long-range signaling molecules able to act in a concentration-dependent manner to induce cellular responses and elicit pattern formation during embryonic development and organ morphogenesis (reviewed in Sagner and Briscoe, 2017). BMPs , well-known morphogens, regulate several aspects of mouse post-implantation development, including germ cell differentiation and anterior-posterior patterning. In the early mouse embryo, BMP signaling requires BMP4 secretion by the extraembryonic ectoderm (ExE) into the pre-amniotic cavity, thereby inducing epiblast cells to differentiate into mesoderm (reviewed in Rivera-Pérez and Hadjantonakis, 2015). Previous work in human embryonic stem cell colonies (hESCs) implicated BMP receptor re-localization along the apical-basal axis as a critical mechanism regulating cellular responses to morphogen signaling and gastruloid self-organization (Etoc et al., 2016). Nonetheless, whether a similar mechanism occurs in vivo and whether it contributes to embryonic development and/or organ morphogenesis has remained largely unexplored. Schematic representation of a pre-gastrulation mouse embryo (adapted from Fig. 1a,b of the preprint). a. The pre-amniotic cavity is surrounded by the epiblast (shown in white) and the extraembryonic ectoderm (ExE, shown in grey). Epiblast cells face the pre-amniotic cavity with their apical membranes and the interstitial space with their basolateral membranes. B. Simulation of BMP4 ligands diffusion (green and blue) diffusion through the epiblast edge (channel) and interstitial space to interact and bind basolateral BMP4 receptors (red) in epiblast cells. Key findings: Zhang and colleagues addressed this fundamental question in the early mouse embryo using a combination of mathematical modeling, embryological perturbation and microfluidics. The authors provide convincing evidence that BMP gradient establishment in the early mouse embryo requires basolateral localization of its receptors. This is corroborated by surface immunostaining of BMP receptors within the mouse epiblast, analysis of the proximal-distal gradient of phosphorylated SMAD1/5 (pSMAD1/5, BMP signaling downstream effectors), as well as by a perturbation assay showing that homogeneous distribution of BMP receptors along the apical-basal axis is sufficient to induce ectopic signaling in distal and anterior epiblast cells (which normally do not exhibit active BMP signaling). The authors propose that restricted accumulation of BMP receptors in epiblast cells limits their accessibility to BMP4 ligands to regions close to the epiblast edge. In this model, embryo geometry is therefore critical, as BMP4 ligands, secreted into the pre-amniotic cavity must diffuse through a channel between the ExE and proximal epiblast edge to reach the narrow interstitial space and bind the basolateral-localized BMP receptors in epiblast cells. Restricted ligand diffusion and preferential localization of BMP receptors within the epiblast therefore cooperate to generate a robust BMP signaling gradient from the proximal epiblast edge inwards, able to buffer strong fluctuations in BMP4 levels. In line with this, in BMP-soaked embryos, where dissected epiblast/visceral endoderm cups are exposed to uniformly high BMP4 ligand concentration, the pSMAD1/5 gradient is displaced only by a few cell widths as compared to wild type embryos. Overall, these findings support the importance of apical-basal receptor localization and geometrical constraints in shaping BMP signaling during embryogenesis. Highlights: This study nicely builds upon recent observations in hESC colonies, so-called gastruloids due to their ability to recapitulate the embryonic arrangement of mammalian germ layers upon BMP4 stimulation (Etoc et al., 2016). This preprint now reports that also in vivo, in the early mouse embryo, BMP receptors localize preferentially to the basolateral membranes of epiblast cells. The authors propose that this preferential localization is sufficient to restrict receptor access to BMP4 ligands diffusing through the interstitial space between the epiblast and the underlying endoderm. Embryo geometry therefore plays a critical role in restricting ligand diffusion in vivo, as it regulates the time and distance a ligand can travel before encountering their cognate receptors. As a result, a BMP signaling gradient is established from the proximal edge of the mouse epiblast inwards. The main advantages of this system are: (a) its ability to generate patterning despite uniform ligand distribution and, (b) its potential to buffer large-scale variations in ligand concentration, since restricted diffusion ultimately limits dispersion of BMP4 ligands within the epiblast. Altogether, this elegant work sheds light on the interplay between BMP receptor polarization and tissue geometry during morphogen signaling and embryonic patterning. Future directions: A critical aspect of the authors’ model is that embryo compartmentalization essentially acts as a diffusion barrier for BMP4 ligands. Although this is supported by fluorescein injections into the pre-amniotic cavity of early mouse embryos, it would be interesting to quantitatively probe the mechanisms of BMP4 transport/diffusion in vivo, using for example photobleaching experiments upon injection of fluorescently-tagged BMP4 ligands. Also, does the channel at the epiblast edge scale with embryo size? Could this contribute to buffer variability in patterning of different-sized embryos? Finally, this study highlights the importance of considering not only polarized ligand secretion, but also receptor localization and geometrical constraints when studying how morphogen signaling establishes robust embryonic patterning, still underexplored aspects in the field of Developmental Biology (Manukyan et al., 2017; Shyer et al., 2015). preLighters Paul Gerald L. Sanchez and Stefano Vianello have also highlighted this preprint – check out their highlight here.